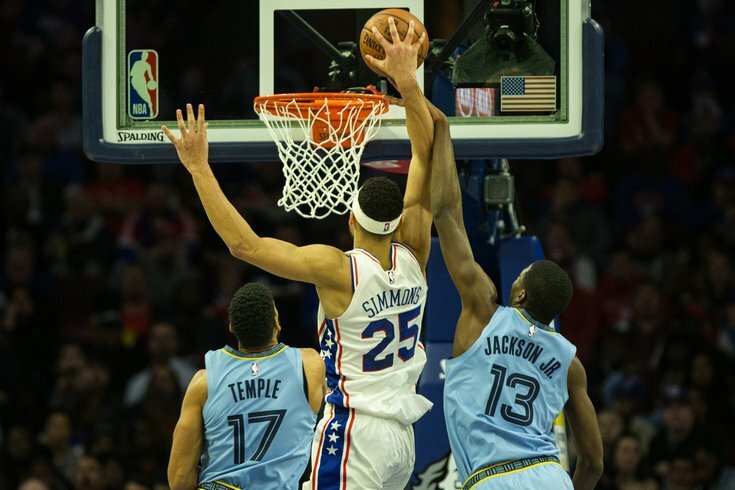 Philadelphia 76ers guard Ben Simmons (25) is fouled by Memphis Grizzlies forward Jaren Jackson Jr. (13) while driving for a dunk during the second quarter at Wells Fargo Center. Sunday was not exactly a dominant evening at the Wells Fargo Center for the Sixers. Joel Embiid struggled to get it going all night, Jimmy Butler took until the fourth quarter to get it going, and there was far too much Amir Johnson in the lineup with Wilson Chandler taking the night off, altering the rotations a little bit. But Ben Simmons, who has been maligned for reasons fair and unfair during an uneven start to the year, came out and seized the game from the opening tip, never really letting go. And the young point guard has been serving a reminder lately that yes, the Sixers do indeed have a three-man core, and that they will often go as far as he is capable of taking them. Labeling him as a point guard, by the way, still feels a bit wrong. It's what his coach does at every turn, and it seems as if that's how he wants to be viewed when he discusses his performances with the media. But his shapeshifting has him doing all sorts of things on a given night — he guards Jaren Jackson Jr. and Mike Conley, he cuts off the ball or beats people with post moves, and of course, he doesn't shoot outside jumpers. Mostly, he's a two-way player. And it was the plays around the margins where he really made a difference on Sunday. Consider this: while discussing his evening against the Grizzlies, Jimmy Butler and Brett Brown brought up two completely different (but just as notable) examples of effort plays he made to keep the Sixers out in front. Both came in the fourth quarter, one in which Simmons hunted down the ball in transition, and one where he saved a ball from going out of bounds, eventually leading to a Butler layup. "It starts with his hustle. If he just says eff it and lets the ball go out of bounds, the game could go either way," Butler said of the save from Simmons that sparked a mini-run in the fourth. "But because he put that extra energy and kept that ball in and obviously we made a bucket, we go ahead and make a couple stops. It all started with that play right there, without him doing that, we don't go on an 8-0 run." "There were a few things that happened tonight that were sort of, not being overly dramatic, defining moments in small ways, if you will. The back tip and coming up with the steal in transition, like you know, the game’s kind of in the balance," said Brown. "His defensive mindfulness, his commitment to playing defense, for way more possessions in a game that we’ve seen lately. His willingness to slide over to the four and let T.J. [McConnell] have the ball and make passes out of the elbow and do stuff. Like all of those things stood out...he's moving in a really clear positive direction. I feel it." The Sixers are 8-2 with Jimmy Butler in the lineup, and a lot of that comes down to the extra edge Butler has given them on top of a much-needed lull in their schedule. But Simmons' production should not be ignored as a catalyst for their recent success. Over the last 10 games with Butler, Simmons is shooting over 60 percent from the field, padding the box score in all three major categories, and settling into a brilliant understanding with the other two stars next to him. Speaking of: Philadelphia's new starting five of Simmons-Redick-Butler-Chandler-Embiid is absolutely brutalizing teams, outscoring opponents by 18.2 points per 100 possessions. It's early, but that's the fourth-best mark in the league for all lineups that have played at least 100 minutes together this season, not too shabby for a unit still trying to figure things out. We'll see how that holds up over time, but the trio of Simmons-Butler-Embiid is already a major positive on its own (+8.5 per 100 possessions), so while the competition will get stiffer, their chemistry will also continue to improve. When Simmons plays as he has lately, they are a completely different team, and one that will be feared when the spring rolls around. One noticeable improvement both Embiid and Simmons have made this season is their emphasis on the early post-up. Embiid's improved fitness levels have helped him get up and down the floor quicker, and he's such a bear down there that he inevitably draws fouls or gets good looks early in the shot clock. But it hasn't just been Embiid who is going to work down there. Simmons has made a concerted effort to demand the ball on the block since Butler arrived, often as teams are still trying to get their defenses set. It has been a big enough factor that I wondered if this was a point of emphasis of the coaching staff, but Brown seemed to suggest it's more about his stars recognizing how successful they can be down there. "We've talked about it, we've shown them film, we've rewarded it, we've reminded them that we play out of an open post," said Brown. "There's always that available, [whether] it's a slow halfcourt game or surely in early offense. I think that when people get rewarded, you're more apt to go and do it more and more without a coach telling you that." It is striking during the games and perhaps even more so on review. There was an instance against Memphis on Sunday where Simmons wasn't even on the screen yet, jostling with Jaren Jackson Jr. for early position before McConnell had even brought the ball up past halfcourt. While Simmons is still not at a point where he's going to punish teams much at the free-throw line, drawing these early fouls benefits the whole team, particularly guys like Embiid and Butler who live at the line as it is. As with the effort examples from Simmons up top, a lot of this is just about intangibles. Embiid and Simmons are both athletic marvels, and as long as they're willing to fight for early position, they will get rewarded one way or another. One of the only complaints you can make about Butler and Embiid lately is there tendency to go a bit rogue on the offensive end of the floor. They have the talent to come up with made shots anyway, but they can't always rely on that over the course of a long season. Sunday you got a glimpse of the limitations of playing that way, at least for the first three quarters. The Sixers were fortunate to be playing against a slow-paced Grizzlies team that ranks in the league's bottom-10 on offense, because they had some downright wasteful possessions with Butler and Embiid in control of things. Some of the looks came out of late-clock desperation, which is understandable, but there were far too many contested jumpers taken on the whole. With Butler specifically, you don't want him to cut this out of his game altogether, and you probably have to live with it to a degree. If you want the guy who is going to confidently hit stepback jumpers in the guts of the game, you're going to have to sit through a few of those same shots as they clang out in the second and third quarters. And of course, when the time came to close it out on Sunday night, it was Butler who hit the jumper that effectively killed off the game. So look, ultimately a small complaint in the grand scheme of things. Philadelphia is trending in the right direction without a doubt — they are now 11th in both offensive and defensive efficiency, in spite of the Markelle Fultz experiment that started the year and a midseason trade that shook up the fabric of the team. There is an assumption they will figure this out on defense with time, and the other side of the ball has been the big revelation, with the Sixers owning the eighth-best offense in the league in the stretch they've played with Butler. All things considered, they're in a good place right now. We'll see just how good when they go up against the Toronto Raptors on Wednesday, a litmus test game that will show how close they are to making real noise in the playoffs.